I love those shower spigots that are supposed to simulate rain - they are so calming and make your shower feel much more relaxing. The water pours over your head in a a soothing stream instead of rushing down in sometimes painful bursts. Now imagine you had this bathroom, and your bathtub had an enormous rain spigot AND a completely separate shower with exposed rock work to maximize the relaxing, calm vibe of the bathroom? Awesome. 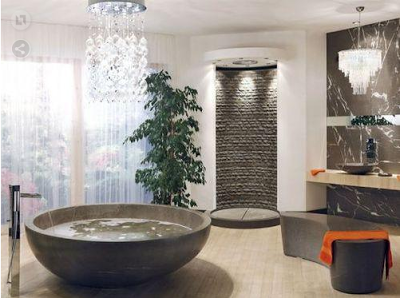 However, I do feel like using the tub in this room would feel like you were bathing in an enormous bowl of rice. That's just me though.